As an organization design consultant, I am sometimes asked by clients how important formal structure is, relative to other factors such as culture or rewards. How strong is the link between structure and business performance? It is of course difficult to say something definite about this topic. It’s a rather complex issue. With a few exceptions (see e.g., this study), there is little research on this topic. 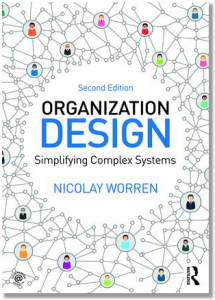 There are many studies that examine factors that may lead to business success, but they frequently ignore organization design variables (this is the case, for example, with the research cited in Jim Collin’s’ books such as Good to Great). Although there are few studies that link structure directly to performance, there is extensive evidence that formal structure shapes how people behave, and which thus suggest that structure has a more indirect influence on performance. In my own book I cite earlier studies that demonstrate, among other things, how formal structure influences the prevalence of conflict and how it shapes communication patterns. As most of these studies are from the 1960’s and 70’s, there has been some doubt, however, about whether the findings still hold true, given the profileration of electronic communication systems. Modern communication technologies greatly reduce the time and cost of communicating, which should facilitate collaboraton across formal boundaries. 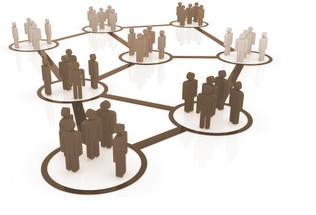 Some have even dismissed the importance of formal structure in modern “network firms”. Yet consider the highly rigorous study carried out Adam Kleinbaum for his doctoral dissertation at Harvard University in 2008. Kleinbaum used data from a large firm’s e-mail server to examine e-mail messages sent by more than 30,000 people over a 3 month period. The study basically replicates the earlier findings about the effect of formal structure. After excluding some types of messages such as mass mailings, Kleinbaum looked at who people were most likely to communicate with via e-mail. If formal structure played no role, one would expect there to be equally frequent communication across different units. But even when controlling for other factors such as gender, salary band and physical distance, he found that people were 10 times more likely to communicate with someone within their own business unit than with someone belonging to a different business unit. (…) we do observe what we judge to be evidence indicating strong effects of organizational boundaries in structuring communication, which seem to us to be more consistent with the traditional image of the organization, versus a more fluid pattern of interaction implied by contemporary visions of the firm. These results don’t prove that one organizational form is more effective than another, or that structure is more important than other factors such as culture or rewards. But they do suggest that formal structure has a powerful impact. Where one draws the boundaries in an organization matters. But rather than discussing the role of formal structure in general, I usually recommend that clients try to find out what the situation is in their companies. One should periodically ask managers and employees at different levels about factors that facilitate or constrain their ability to achieve specific strategic goals. In this manner one can assess whether the organizational structure is appropriate given the strategic goals and business processes of the organization. One can also employ systematic methods for this purpose such as employee surveys (see my previous post about this topic here). Your assertions that “formal structure shapes how people behave” and that it “influences the prevalence of conflict and… shapes communication patterns” makes sense to me, Nicolay. I was led to your blog by another discussion, prompted by Tibor Novak (http://www.linkedin.com/groupItem?view=&gid=63688&type=member&item=73342981&commentID=55430773&report%2Esuccess=8ULbKyXO6NDvmoK7o030UNOYGZKrvdhBhypZ_w8EpQrrQI-BBjkmxwkEOwBjLE28YyDIxcyEO7_TA_giuRN#commentID_55430773). Tibor asked the question, “What’s more important? To change the structure or to change peoples’ mind?” In the course of the discussion, he notes that “most organization development practitioners seem to select ‘changing people’s mind'” and cautions against “forget[ting] about structure.” We side with Tibor’s caution and with your view that structure plays an important role in organizational life. Structural changes (procedures, practices, regulations, etc.) often create conflict (resistance), which surfaces clues about deeply held, probably unconscious, organizational assumptions. These resistance-producing assumptions, or preferences, when held by a critical mass of employees create the opportunity to engage employees in constructive conversation about the intent of the structure and about the nature of their resistance. You can read some of our thoughts about organizational mindset at http://www.metapower.com/pdfs/Is-Our-Industrial-Culture-The-Problem.pdf, and you can read about the importance of structure and our methodology for addressing resistance to structure at http://www.metapower.com/pdfs/is-all-this-paper-necessary.pdf.